MEV have developed a significant design expertise in RS485 communications for the industrial sector and have produced several interface products. The MEV RS485 Repeater allows communication between RS485 systems in otherwise impossible situations. The RS485 data transmission standard requires that each network node be linked via a single transmission line terminated at each end in its characteristic impedance. Furthermore the total transmission line length is limited to approx. 1Km. Sometimes it is necessary to transmit over longer distances, or to run networks with spurs off the main cable run. The model R485i opto-isolated repeater solves these problems by creating a second network electrically isolated from the first. It receives signals on one network and re-transmits them on another. The opto-isolation coupled with the ESD / static discharge protection, which is fitted as standard, makes the network less susceptible to damage from nearby lightning strikes or other differences in local earth potential. Unlike other converters the Magics can convert any RS232 port to RS485 without special software or additional hardware. The transmitter is automatically enabled when the intelligent converter detects that data is to be transmitted. As with the standard converters it is bi-directional and converts data lines only, handshake lines are looped back internally. Half duplex, two wire RS485 operation is supported. USB serial converters add RS232 or RS485 ports to a PC or laptop. 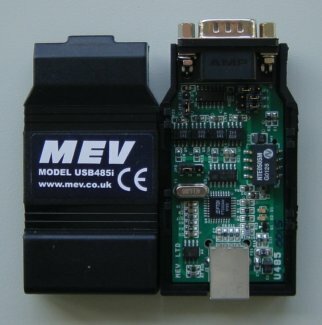 MEV have been making these for over 15 years and they have been very successful. The unit is fully opto-isolated giving excellent protection to the PC in harsh environments. The converters take their power from the USB port, which is perfect for portable and industrial applications.